Choose me or pay the price! With Worldcup Soccer underway in Brazil lets have some fun. There are many good athletes in the Marvel Universe which ones would make the best Soccer Players. Beyond athleticism which powers would be the most handy? Here would be my top draft picks for a Marvel character soccer team. Who would you choose? 1) Magic users- Soccer has no rules against magic. Meaning who knows what kind of magical chaos could be unleashed during a game. A magic user for a team would be necessary if just to defend against magic users on the opposing team. It might also be interesting to field an all magical team if possible. High on the list of Magic Users would be Dr Strange, Brother Voodoo, Enchantress, Morgana Le Fay, Dr Doom, Lorelei, Sister Grimm, Shaman, Magik, Baron Mordo, Wiccan, The Scarlet Witch. 2) Telepathy/Telekinesis - Soccer has no rules against Telekinesis or Telepathy making Charles Xavier, Emma Frost, Mastermind, Mantis, X-Man Nate Grey, Mr Sinister, Cosmo, Moon Dragon, Purpleman and Jean Grey almost necessary. 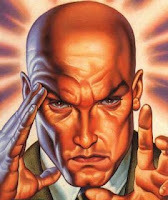 If nothing else you need a telepath for defense against other telepaths.While it may seem weird taking someone physically unable to kick a ball, Charles Xavier could win a game if no one is able to stop his mind control. 3) Quicksilver - With his amazing super speed it would be hard to overlook the mutant speedster Quicksilver. He could technically play all the positions at the field at once. He could threaten offensively while near instantly returning back to defense. 4) Sue Richards the Invisible Woman - She can create invisible force fields to hide the ball, stop the ball, hide a player. Yes that is crazy she would be a very difficult player to go up against. 5) Nightcrawler - His ability to teleport plus his insane agility would make Nightcrawler a very strong soccer player. He may be one of the few characters who could counter the insane speed of Quicksilver or the Force Fields of Sue Richards. 6) Spiderman - With some of the highest reflexes and agility in the Marvel Universe Spiderman would make a phenomenal goalie but could play a variety of positions as well if needed. 7) Beast - Strength, Agility, Speed, Reflexes it would be hard to beat Beast as a goalie. 9) Mr Fantastic - The guy can stretch and stretch and stretch. He could play a variety of positions I think it would be interesting to either have him as a goalie or on defense. 10) Other interesting characters Banshee/Siryn could potentially use sonic screams to move the ball, Captain America for his athleticism and leadership, Iceman because who knows what he is capable of doing. The Inhuman Medusa could do some crazy things with her hair and hey haird does not equal hands. The Superstrong Behmothes - Sentry, Juggernaut, Hulk, She Hulk, Guardian, Blackbolt, Thor and all of the Asgardians may make tempting picks but be warned. These characters are so strong they may have difficulty kicking the ball inbounds. It might be tempting to take one as an enforcer but this is not hockey and if they act out they will quickly find themselves with a red card and out of the game. Also Wolverine may seem like a good pick but I tend to think he would get handsy.